Deco Divas - Love is in the Air Blog Hop! If you arrived from My Creative Corner - Gerlinde then you are hopping along the blog party trail just fine. There are four fabulous prizes to be had; to be eligible just start from the beginning at the Sparkle N Sprinkle blog and comment along the way for your chance(s) to win. My inner Diva is throwing a Romantic Art Deco party!! The Roaring 1920's were a time of new freedoms in art, dress, design and music. I love Sparkle N Sprinkle South Beach stamp set, it has a great mix of art deco design with a touch of art nouveau, and it makes my heart swoon. For my first project I made wine glass charms from polymer clay...you don't want to forget which glass is yours! With all the colors of glitter available at Sparkle N Sprinkle you can invite as many guests as you wish and still let each one have their own unique color. Using the Palm Border Stamp makes this project easy because with only one stamping you complete 4 charms. Check out the directions here. Can't let you go home empty handed, so for my second project I made goodie bags. 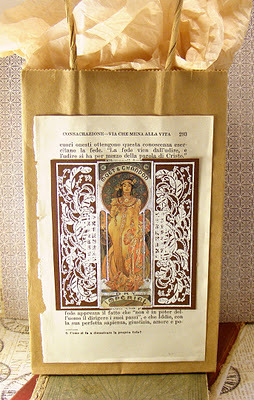 Not able to resist the urge to use an Alphonse Mucha image, it was a great match to the intricate Floral Border stamp. These are really nice and deeply etched stamps that work well with detail embossing powder . Directions for this project are here . Thanks for stopping by and don't forget to leave a comment to be eligible for the fabulous prizes being given away. Angie your projects are really great . I ready for the party!!!! Beautiful projects! I never thought about working with glitter and polymer clay. Two of my favorite things to work with! How classy! Love the wine glass charms. and with yiour beautiful goodie bag in hand, I will feel well "dressed" for the party. I love the Alphonse Mucha Image. The detail of the image is definately my style. I like the way you put it together with the book page and the Floral Border Stamp. Thanks for sharing. Now that's what I call thinking outside the box! Great ideas - let's get this party started! Those wine tags are amazing and I love that gift bag, it's gorgeous! I love it! So, what time does the party start? Angie these are amazing and the look you got with the bag and the floral design just blew me away! Such fun ideas Angie! Add me to the list....Love those charms! And the bag completes the look perfectly! Great set for a perfect party! Angie, your tags and bag are lovely! You did a wonderful job on these! Wow...two great ideas and so beautifully executed! Loving the wine charms and that bag is gorgeous! Angie, those wine charms are so precious with just the palm head showing. Using glitters so guests remember "whose is whose" is a marvelous idea! And makes a great gift idea, too. The use of your white detail EP in the gift bag is so pretty! Love your techniques and styles. Beautifully created and written. Even though I do not use polymer clay I always appreciate the work that goes into creating with it. I own quite a few one of a kind polymer clay pieces created by great crafters, like yourself. Beautiful Angie! So nice to see you work with different medium. Those charms are just a wonderful idea and the image you embossed looked out of an ancient book. Great job! How very different. I've never worked with clay, so I am intrigued. Great idea! The gift bag is very deco looking to me too. Okay talk about creative. 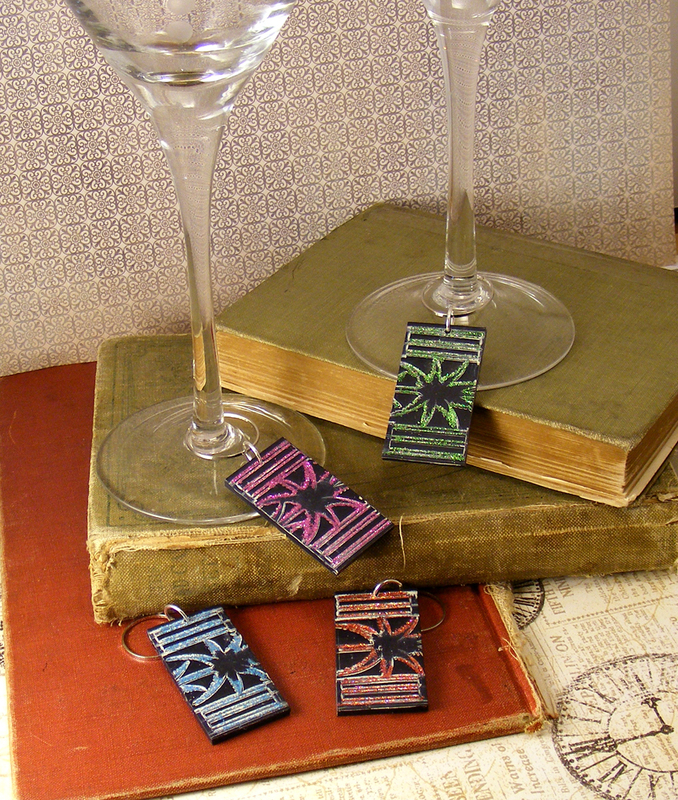 I would have never thought to make tags for glasses! I love your goodie bag too. That would be a good keep out in plain sight. I absolutely love your ideas. 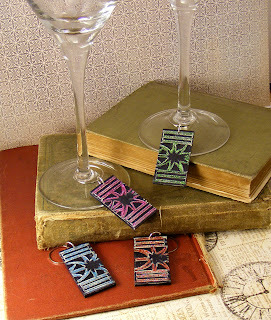 The wine glass charms are a super idea for a party. And, of course, taking a goodie bag filled with treats is always a welcome gift to bring. Thanks so much for sharing! Oh, Angie, I love those wine glass charms! How clever. And the decorated bag is perfect. Great use of the border stamp. I have that one and never thought to pair it with a vintage image but I will now. Thanks for the inspiration! Super Duper Wine glass charms. What a clever idea! Fantastic to use as "no reason presents". Thank you for sharing. Loving the wine charms...great idea! And that gift bag is oh so elegant! I love the charms, what a great idea! Angie, both these projects are gorgeous! Love the wine charms - so creative! The bag is beautiful! Can't wait to see what you come up with next! Angie, what great projects. Love how you made the charms and your bag is so amazing. Angie just charming! I love the wine charms with the art deco theme. What a unique bag too! Great creations. What a beautiful idea for a hostess gift and with the bag decorated it adds a special touch. The wine charms are and added touch. 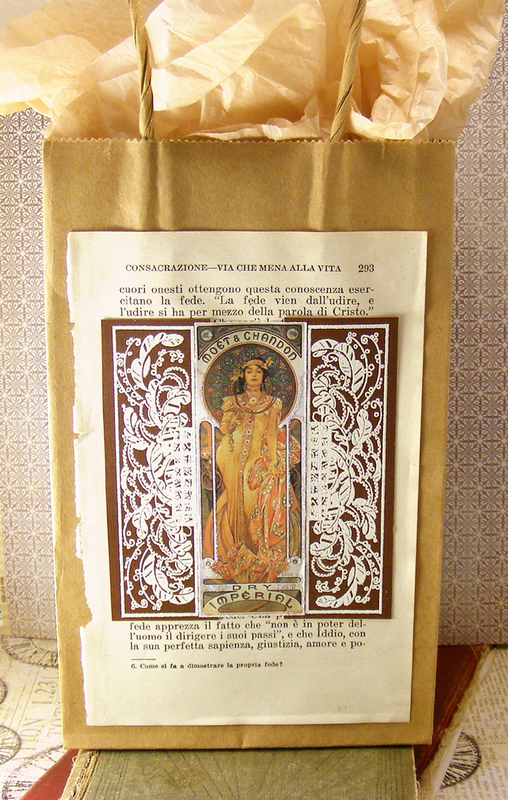 I loved the decoration on the goodie bag, the Mucha image. You mention that it is copyright free. Is there a specific website you use? I love fine art. The side panels were also very fine and worked so well with the image. If you have the time, I would like an answer to my question. My email is danda88@verizon.net. You gave me a new perspective, a new set of possibilities. Thank you very much. I've never heard of wine glass charms! What a neat idea. I love the wine glass charms. Thank you for sharing your ideas. Angie the goodie bags are terrific. The wine glass charms are rather unique. I love your choice of glitter colors. The wine tags are so cute! LOVE the wine rings!! They're beautiful!! I wish I had room in my craft rm. for clay I love your wine charms. Perhaps I can do the same thing with paper & then laminate them.